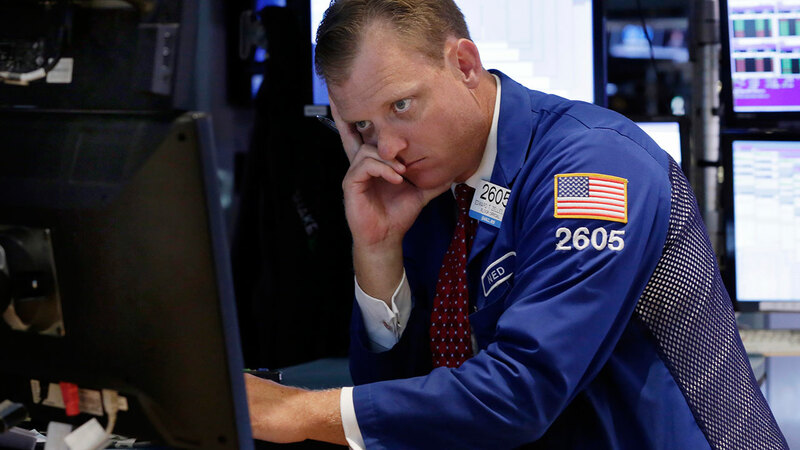 NEW YORK -- U.S. stocks slumped again Monday, with the Dow Jones industrial average plunging more than 1,000 points at one point in a sell-off that sent a shiver of fear from Wall Street to Main Street. How concerned are you about the financial markets? Scroll to the bottom of the article to take our poll. Stocks regained some of that ground as the day wore on, but the Dow Jones industrial average finished the day down 588 points. The slump - part of a global wave of selling triggered by the slowdown in China - reflected uncertainty among investors over where to put their money when the world's second-largest economy is in a slide. "What's a company that's doing business with China actually worth right now? When you're not sure, you tend to sell," said JJ Kinahan, TD Ameritrade's chief strategist. The Standard & Poor's 500 index also fell sharply shortly after the opening bell, entering "correction" territory - Wall Street jargon for a drop of 10 percent or more from a recent peak. The last market correction was nearly four years ago. U.S. Treasuries surged as investors bought less risky assets. Oil prices fell. But investors also saw opportunity, moving fast and early to snap up some bargains. That helped trim some of the market's earlier losses. The Dow fell 588.47 points, or 3.6 percent, to 15,871.28. The S&P 500 index slid 77.68 points, or 3.9 percent, to 1,893.21. The Nasdaq composite shed 179.79 points, or 3.8 percent, to 4,526.25 points. The three indexes are down for the year. "There is a lot of fear in the markets," said Bernard Aw, market strategist at IG. The sell-off triggered worries in corporate boardrooms, in government capitals and among ordinary Americans young and old who have been saving for retirement or a down payment on a house. Heightened concern about a slowdown in China had already shaken markets around the world on Friday, driving the U.S. stock market sharply lower. The rout continued Monday as China's main stock index sank 8.5 percent. The Dow plummeted 1,089 points within the first four minutes of trading as traders dumped shares. But the fire sale was short-lived. A wave of buying cut the Dow's losses by half just five minutes later. The U.S. market slide was broad. The 10 sectors in the S&P 500 headed lower, with energy stocks recording the biggest decline, 5.2 percent, amid a continued slump in the price of oil. The sector is down almost 25 percent this year. Newfield Exploration was down the most among stocks in the S&P 500, shedding $3.19, or 10.4 percent, to $27.63. AGL Resources led among the gainers, rising $13.55, or 28.3 percent, to $61.41. Stocks have been on a bull run of more for more than six years, after bottoming out in March 2009 in the aftermath of the financial crisis and the Great Recession. China growth concerns aside, U.S. stocks have been primed for a sell-off for several months, said Jim Paulsen, chief investment strategist and economist for Wells Capital Management. "I've been of the view since late last year that this market is in a vulnerable position," he said. "It's gone almost straight up for six years." Stocks have kept climbing even as corporate earnings growth has slowed. The price-earnings ratio for the S&P 500, a measure of how much investors are willing to pay for each dollar of company earnings, climbed as high as 17.2 in March. That was the highest level in at least a decade, according to data from FactSet. Oil prices, commodities and the currencies of many developing countries also tumbled Monday on concerns that a sharp slowdown in China might hurt economic growth around the globe. Benchmark U.S. crude dropped $2.21 to $38.24 a barrel in New York. Metals also ended the day lower. Gold fell $6 to $1,153 an ounce and silver declined 54 cents to $14.76 an ounce. Worries about a China-fueled global economic slump sent markets overseas lower, as well. In Europe, Germany's DAX fell 4.7 percent, while the CAC-40 in France slid 5.4 percent. The FTSE 100 index of leading British shares dropped 4.7 percent. In Asia, Japan's Nikkei fell 4.6 percent, its worst one-day drop since in over 2 1/2 years. Hong Kong's Hang Seng index fell 5.2 percent, Australia's S&P ASX/200 slid 4.1 percent and South Korea's Kospi lost 2.5 percent. The Shanghai index suffered its biggest percentage decline in 8 years. The market has lost all of its gains for 2015, though it is still more than 40 percent above its level a year ago. Underlying the gloom in China is the growing conviction that policymakers and regulators may lack the means to stem the losses in that nation. The country is facing a slowdown in economic growth, the banking system is short of cash and investors are pulling money out of the country, experts note. App users take our poll here.